In just a few days, an old bearded man wearing red will swoop down from the skies in his sleigh, land on the roof, slip down the chimney and leave Christmas gifts under the tree for my two amazing boys, before drinking a glass of milk and eating a couple of mince pies, and then climbing back up the chimney – without forgetting to take the carrot we’ll have left for his flying reindeer. Yes, Christmas is upon us, and perhaps we presenters could learn a thing or three from Santa Claus about the art of presenting. Firstly, Santa comes a very long way to deliver gifts, in return for a bite to eat, a glass of milk and a raw carrot, and more importantly, the smile of a child. As a speaker, you might be paid a little more generously, but whether you are paid thousands or nothing, you should treat a presentation as a gift you are offering to your audience. Santa only comes because children believe in him and behave well enough to deserve presents. You are only on stage because your audience believes in your ability to change them in a positive way. You are there for them. Your presentation is your gift to them. Treat it as such, from the moment you begin to prepare for it. Their smile, their thanks and the positive change in them will be your greatest reward. Likewise, every audience is different, and you need to adapt your talk to your audience’s expectations. Don’t give them something that was on someone else’s wish list. Usually my university talks get very high ratings, but on one occasion this year, the ratings were merely good. Why? On examining their comments, it turned out that the students had been led to expect something completely different to what I’d been asked to talk about, and they were measuring my talk against their (wrong) expectations, even though I’d set out my objectives clearly at the start. So as far as you can control it, work out what your audience is expecting, and then meet or exceed those expectations. It doesn’t matter how great your talk is: if it’s not the one they have set their heart on, they will be disappointed. Santa (usually) gives kids what’s on their wish list. Do likewise. Could you imagine meeting Santa in the living room, and finding him scowling or growling? Santa is a happy, jovial chap, or so we imagine, and behind his white beard there is a perpetual smile. A presenter or entertainer who actually looks like she is happy to be there—because she really is—is well on her way to engaging her audience naturally. Another key reason for smiling is the power of mirror neurons. What you visibly feel, the audience subconsciously feels too. If you look happy, they will feel happy. And just as Santa wants kids to be happy, you want your audience to enjoy your presentation. After all, if they enjoy it, they will pay more attention, and that means they are more likely to get your message and even do something with it. Making your audience enjoy your talk should always be a major objective. Smile, and you are halfway there. So there are three things to learn from Santa Claus: treat your presentation as a gift to your audience; tailor that gift to that particular audience; and smile. With that, let me wish you all a very Merry Christmas, and a happy, healthy and inspiring 2012. We don’t ‘do’ presentations. We ‘give’ presentations. And we should treat them as special gifts which we give to our audience. When you give a gift at Christmas for example, you could just choose to give everyone a pair of socks. Would you really do that? Not if you want them to be truly grateful. Instead, you would most likely choose a gift specially for each person, based on what they like and what they need, and perhaps based on what they told you they would appreciate. The best gifts are often hand-made or even made to order for a particular person. So you should prepare your presentation in the same way. Make it the best gift you could offer to a particular audience on a particular day in a particular setting and context. When opening presents (particularly from mothers-in-law and aunts), some people expect the worst, based on previous unpleasant presents. In the same way, when turning up for a presentation, many audience members expect the worst: a standard, boring talk. So it only takes a little effort to give them a pleasant surprise. Don’t give socks. Make each presentation a personal gift – and your audience will thank you. It’s almost Christmas, and even those of you who don’t celebrate it can appreciate the wonderful non-religious song The Twelve Days Of Christmas. I like the way it builds up and repeats the messages until you end up remembering it all and going through it all at the end. Some presentations would benefit from building up in this way. Anyway, as a fun post to finish the year, here are my Twelve Presentation Days of Christmas. Imagine this as the last verse, but of course if you want to sing it all verse by verse, be my guest! And as a New Year’s Resolution for 2011, perhaps you could consider NOT inflicting any of these on your audiences? Merry Christmas and a very Happy New Year 2011! I’ll be back blogging in January. And a printout of their awful slides. Stories are a great way to communicate messages, and analogies are a key part of this. Here’s an analogy using story, all about how using great slides as visual aids is more powerful than using slideuments. Before I start, I should make a short disclaimer. Garr Reynolds is a Star Wars fan and has used this analogy many times on his Presentation Zen blog (and he does a mean Yoda impression too), and Nancy Duarte used Star Wars Episode 4 to exemplify the art of storyline in her brilliant book Resonate. To those who would suggest I’m just copying them, I would state that imitation is the finest form of flattery, and besides this is a very different exercise. Plus I’m not much of a Star Wars fan to be honest. The Shadow had returned to Boredor, and it was working tirelessly to spread its malevolent influence across the whole land of Middle-Management. The Dark Lord, Microsauron, had unleashed a deadly new weapon to torture, bore and demoralise the free people of the world and bring them unwittingly under his power. It had many names, but since it was powerful and many torture implements are pointy, they mostly called it PowerPointy. However, far away, a Jobbit called Stevo discovered something shiny and unique, and he decided to call it the iRing. It became known that this iRing used to belong to Microsauron and contained much of his source code, and Stevo was asked to bring it to Rivendell to decide what to do with it. The Council of Elrond brought together representatives from all the great nations, and Elrond’s message was that the only way to defeat Microsauron was to take the iRing to RedMount Doom and throw it back into the fire whence it came. He convened the Fellowship of the iRing to undertake this dangerous but vital quest. 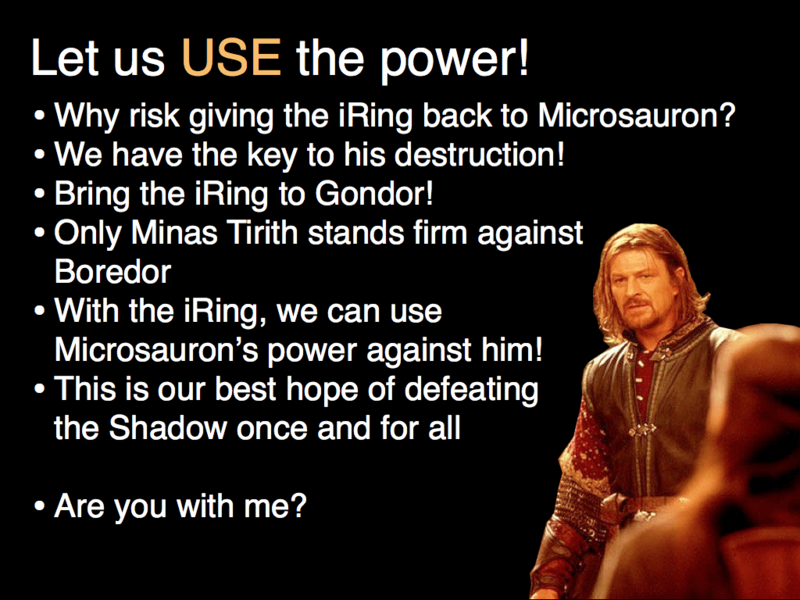 The warrior Borismir argued against this, stating that it would be better to use Microsauron’s power against Boredor. Unfortunately, his slideument was not very convincing, so it was agreed to proceed with the quest. However, Elrond had himself come under the Shadow’s influence, and he made the fatal mistake of using a slideument to explain the Fellowship’s mission. Sadly but inevitably the Fellowship didn’t understand the whole message, although they thought they’d read it properly, and they didn’t realise that “Watch out for Googlum” meant that it would be a good idea to stay away from him. Instead, they welcomed his offer to guide them, and Googlum led them to their doom in the Great River Androin, where the iRing was lost, never to be seen again. Only Stevo the Jobbit and the wizard Garrdalf escaped, and they fled to the woods of Lorien, where they were found by elves and taken to their leader Nancydriel who lived in the highest tree, with its majestic mountain view. Nancydriel had long studied slideology, and she showed them that in fact Borismir had been right about using Microsauron’s powerful technology to defeat his Shadow – it just had to be used in the right way. Then she shared with them the secret of the One Slide To Rule Them All – the most powerful slide ever conceived, so powerful that it could break the trance-like spell of the slideuments, and vanquish the Shadow of boredom for ever. Stevo and Garrdalf then made their way to Minas Tirith, where the Shadow had already taken a firm hold, and no meeting was safe from the scourge of the slideument. Taking advantage of the bored stupor of the city’s residents, Microsauron had unleashed the full force of his mighty armies, who were already beginning to bombard the citadel with bombs, patches and overstocked Zunes. There was no time to lose. Quickly, Garrdalf and Stevo found the biggest projector in the city, raised up a huge screen above the walls, set up a microphone, and Stevo took the stage. He began to deliver the presentation which Garrdalf had written, and which they had rehearsed meticulously as they rode over the plains of Rohan. Both armies stopped and listened, and looked in wonder as Stevo told them stories (with lots of superlatives) and illustrated them with slides which mostly just had pictures – yes, pictures, and maybe only a few words or a number. The black clouds that had filled the skies began to recede to the East, back towards RedMount Doom whence they came. The spell of the slideument was being broken, and one by one, everyone watching realised that in fact Microsauron’s technology could be used to enhance communication, not just to impede it. Then when the time was just right, Stevo clicked forward and unveiled the One Slide. The crowds gasped. Weapons fell to the floor, jaws dropped, and there was absolute silence, apart from the clear sound of Stevo’s voice which spoke clearly and directly to every individual present. Everybody paid attention. They could not do otherwise. Slowly it dawned on Microsauron’s armies that their foes had found a way to harness the Dark Lord’s power, and vanquish the slideument for ever. As Stevo spoke clearly, simply and passionately, they realised they could not win, they panicked, and they fled. In the end it was all remarkably simple. Stevo just had to show a completely black slide, and suddenly the audience would have nothing to look at but him, the presenter. That was the One Slide, the most powerful slide, the beauty of simplicity, one could say an anti-slide, the best way to defeat the slideuments. Between them, Stevo the Jobbit and Garrdalf had beaten the Shadow, and shown the world of Middle-Management how real presentations should be done. No longer would the terror of Death By PowerPointy haunt meeting rooms across the land; no longer would people tremble at the words “I’ll come back to that on slide 87”; no longer would the word ‘presentation’ be synonymous with ‘mind-numbing boredom’. And perhaps people would realise that in fact it wasn’t Microsauron who had inflicted all that pain on them, but their own dumb use of his perfectly good tools. Meanwhile, Microsauron realised his plan to conquer the world through boredom had been foiled, but what most people didn’t know was that it was only his Plan B. Originally, his Plan A was to use his great presentation technology to convince everybody to join forces with him, and take over the world peacefully, but sadly it hadn’t worked because he hadn’t found the right way to use the tool. Luckily, neither had most other people, so Plan B happened almost by accident. The World’s Best WHAT Contest? From one badly-named contest to another. Apparently something called the World Series has just been won by a team of giants from San Francisco. Yet this competition was contested only by American teams. There’s a badly-named contest if ever I saw one, although I didn’t see this because of course, being a US-only event, it’s not shown in France. There’s another badly-named contest currently running though. I have written before, as have many other presentation experts, about how one of the fundamental problems with modern corporate communication is that we mistake a slideset for a presentation. A deck of slides is a visual aid for a presentation – it is not a presentation. If your slides say everything, then why do you need to stand up and talk? If they say everything, and you talk anyway, will anyone actually listen to you? No, they’ll try to read, and try to listen, and fail miserably at both. There is a name for images and text, without audio, which tell a story. They’re called cartoons. Now I have nothing against cartoons, and they can be excellent means of communication (not just to kids), but they are not presentations. A presentation is when somebody stands up and tries to communicate something to a group of people. With or without visual aids. So I find it fundamentally wrong that SlideShare is running a competition which they call “The World’s Best Presentation Contest”, and almost all the front-runners are slidedecks which tell the whole story. Many of them look great, and Scott Schwertly’s promo for his new book How To Be A Presentation God even embraces the cartoon idea, because that’s what these decks are. They’re not presentations. One entry, from Jean-François Messier, demonstrates (quite well) how slideuments really don’t work – they are neither documents nor slides, so you should not attempt to create slides which tell the whole story. Yet, ironically, that’s exactly what he created for this SlideShare competition. Which just goes to show that a good entry for the competition is almost certainly not a good set of slides to accompany a presentation. There is one of these slidedecks which would be a great set of visuals to support a presentation, and that’s the one done by AnaFxFz for Guy Kawasaki’s Enchantment talk. That’s because it IS intended to accompany a talk. It doesn’t say everything on its own. So it doesn’t work as a cartoon because it needs the narrative. Yes, I voted for the one deck which doesn’t work properly on SlideShare but which is a real set of presentation visuals. Wouldn’t it be ironic if Ana wins! Take a look at her great deck here. I don’t blame the others who have created fine slidedecks knowing there would be no audio, and some are very good (I particularly like the ones by Jon Thomas and Ed Fidgeon Kavanagh) – they’re just following the rules and using this cartoon-type medium as well as anyone. I just think there’s something missing. If part of the problem with corporate communication is that the slides have become the presentation, SlideShare is simply perpetuating that problem by providing a platform which allows people to share standalone slidedecks without audio (although they do provide the audio option, it’s rarely used). This contest, and its name in particular, really doesn’t help. I wouldn’t mind if they called it “The World’s Best Slidedeck Competition”. It’s good that many people are starting to realise that slides can look great, and SlideShare deserves some credit for helping that movement. Unfortunately, if all it does is convince people to create better-looking slides that still tell the whole story, we’ll just replace Death By PowerPoint with Death By Pretty PowerPoint. You are currently browsing the archives for the Offbeat category.